North Korean diplomatic staff returned to the joint liaison office in Kaesong on Monday, three days after withdrawing in apparent anger over new U.S. sanctions against Chinese companies that conducted illegal business with North Korea. The return was seemingly inspired by President Trump ordering the sanctions withdrawn… but the White House said over the weekend that he was referring to different sanctions that have not been imposed yet. U.S. President Donald Trump in a surprise announcement Friday withdrew a new round of sanctions against North Korea that had been announced only 24 hours earlier by his own government. 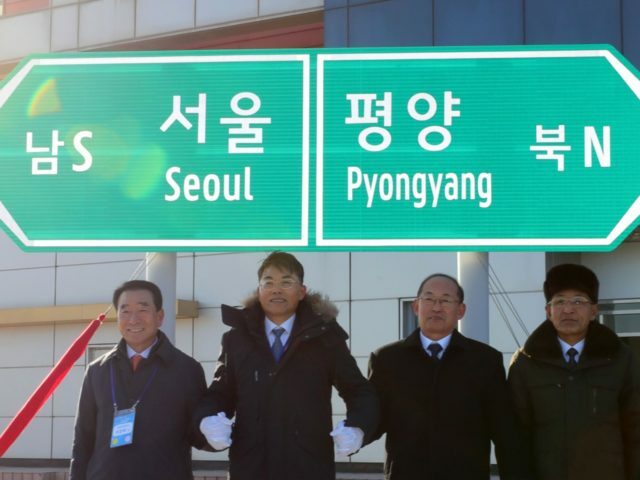 The move came 17 hours after Pyongyang notified Seoul that it is pulling officials from the new inter-Korean liaison office in the North Korean border town of Kaesong. It is unclear what specific sanctions Trump was canceling. He may have been referring to the Treasury’s announcement of sanctions targeting two Chinese shipping companies that helped North Korea evade sanctions. But U.S. media said he was talking about another round of massive sanctions his administration was preparing to announce this week. Trump’s spur-of-the-moment change of position is no longer surprising but cause confusion because he seemed uncertain what he was talking about. Until then it seemed that Washington was determined to take a harder line on North Korea after a bilateral summit in Hanoi collapsed. According to Chosun Ilbo, South Korean officials were “flummoxed” on Friday when their North Korean counterparts packed up some papers and departed from the Kaesong office, which is located near a currently inactive joint industrial facility on the border between the two Koreas. They were equally flummoxed when a half-dozen North Koreans showed up for work at the liaison office on Monday, but quickly responded by beefing up the South Korean presence at the facility to a total of 79 staffers, about triple the number that stayed at their posts over the weekend after Pyongyang withdrew its delegation. South Korea’s diplomatic reinforcements arrived at Kaesong in a convoy of 17 vehicles, a passage which had to be approved by the North Korean government. Seventy-nine South Koreans arriving at Kaesong to engage with five North Korean officials sends quite a message about the South’s eagerness to resume dialogue, even though Chosun Ilbo admitted “no meaningful work” has been done at the facility since it opened last September. “South Korea’s Unification Ministry earlier would not explain exactly what the 64 officials would be doing at the office without their North Korean counterparts, but a spokesman said Seoul is seeking to try to ‘normalize’ operations at the office,” Reuters wrote. North Korean staffers reportedly told South Korean officials, “We came to do our shift as usual today.” They declined to elaborate on precisely why most of the North Korean delegation left on Friday. The North Korean staffers added that Pyongyang wishes the joint liaison office to “implement projects in accordance with the inter-Korean joint declarations” made over the past year. North Korea’s state-run media carried exactly the opposite message on Monday morning, railing against the South Koreans for “shamefully” daring to pursue “inter-Korean cooperation projects” while sanctions remained in place against North Korea. South Korean media reported on Monday that the United Nations granted a six-month waiver from sanctions against agencies providing humanitarian assistance to North Korea, including food and medical services.